New photos of the Duchess appear on the cover of this weeks Australian WHO Magazine (with many thanks to British Royals and What Kate Wore for kindly sharing details from the article). You can see the rest of the photos here. The photos, taken on June 19th, show the Duchess going to the Rossano Ferretti Hair Spa in Mayfair, Kate is normally photographed at the Richard Ward salon, perhaps she changed? 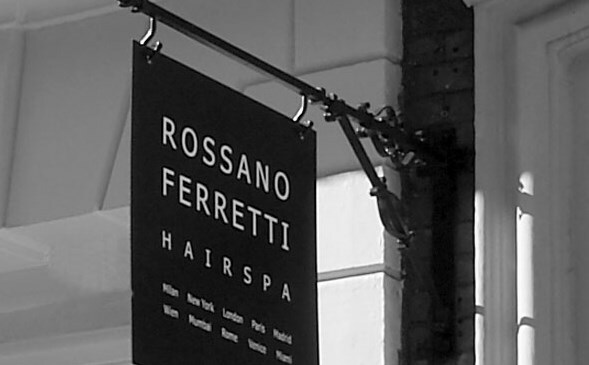 Both Carole and Pippa Middleton have had their hair done at Rossano Ferretti who opened his London salon earlier last year. After doing hair at catwalk shows for Armani and Dior, he spent the last two decades perfecting the art of the haircut. His celebrity clients include Angelina Jolie and Salma Hayek. Three of Rossano's styles for longer hair. A look inside Mr Ferretti's London base, a beautiful townhouse. He owns salons all over the world including L.A., New York, Mumbai, Rome, Vienna, and Paris. It would be very interesting to see how Kate's glossy locks looked after spending 3 hours with the famous hairstylist. A typical cut and blow dry at the salon would set you back £200. Maternity brand Séraphine have confirmed the Duchess wore their White Maxi Skirt. The £39 piece is 100% cotton and can also be worn as a dress. The Duchess carried an old Russell and Bromley bag (with thanks to Ashley Marie). We know the Duchess said in April that Baby Cambridge is due "around mid-July but babies have their own agenda". Nonetheless, the royal community is preparing for any date with royal correspondents sleeping with their phone on and getting very little rest. There's a real sense of excitement and occasion surrounding the birth of a future monarch and it only happens every few decades so it is indeed very special. I know many of you are hoping Baby Cambridge is born on July 1st - the late Princess Diana's birthday. It might seem too early a date, however according to some experts the baby could be due ten days earlier than previously thought. It certainly does seem possible, as the July 13 date being used in the press is merely speculative - the Palace never confirmed it. Whenever Baby Cambridge does arrive; one thing is for sure it will be celebrated around the world. It is, the Washington Post declared, "the world's most famous baby" - the royal birth is likely to generate £260 million worldwide. Around the globe celebrations have already begun with former Australian Prime Minister Julia Gillard knitting a kangaroo for the new arrival. 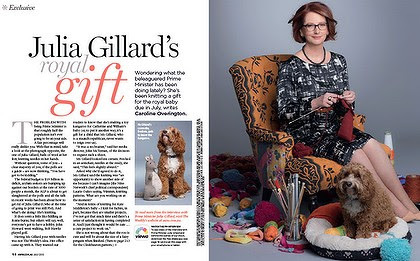 Ms Gillard, a republican said she thought knitting for the royal baby would be a "cute project to work on". 'Knitted kangaroos, however, are just the tip of the iceberg of international obsession with the new prince or princess. Interest has been piqued by a number of recent royal tours: Kate and William's trips to the Far East and Canada; Harry's US visit in May and the various Diamond Jubilee expeditions all helped to raise the monarchy's profile abroad. In Canada, celebrations have been organised nationwide, including a naming party at a naval officers' mess in Ottawa. 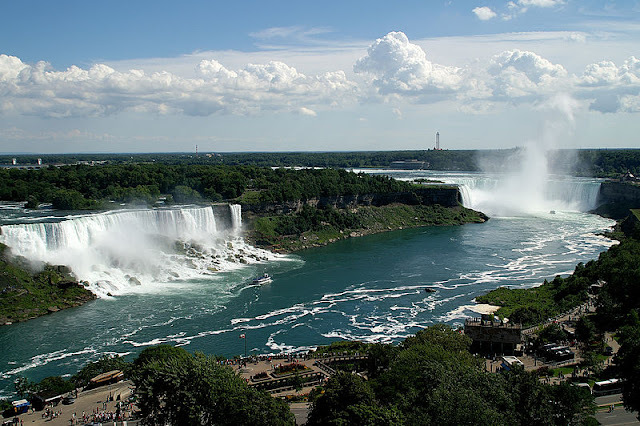 President of the Monarchist League of Canada said: "We're asking for significant monuments to be lit up in blue or pink, such as Toronto's CN Tower or Niagra Falls. There has been a noticeable surge in Canadian interest in the Royal Family in the last few years." The Times of India has a section dedicated to Baby Cambridge as do publications in Russia, France, Germany, Italy and Mexico. Philip Benwell, national chairman of the Australian Monarchist League said "Social media is going wild about the event. Women's magazines are all ready to make a huge splash of the royal birth...he or she does not belong only to the United Kingdom but to us as well." The frenzy is nothing new, though, as Prince William's birth was one of the top-selling magazines of all the time - it was also a global phenomenon. The main story making the British headlines about the Cambridges is surprisingly not Baby Cambridge but the cost of renovations for their apartment at Kensington Palace. Officials who revealed the royal expenditure earlier this week said around £400,000 had gone on the roof and £600,00 revamping the interior, including asbestos removal. 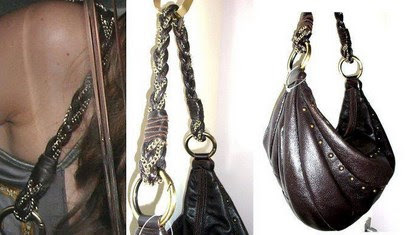 Sir Alan Reid, Keeper of the Privy Purse said because "funds were tight" the Historic Royal Palaces were not able to make the refurbishments needed but when the apartment was chosen as a home for the Duke and Duchess the work needed to be done. The Cambridges are paying for all furnishings with their private money. The apartment was once Princess Margaret's home and has been used for office and storage space since her death. The Queen's former press secretary Dickie Arbiter pointed out the apartments have not been touched in over forty years. What else did the royal expenditure reveal? The royal tour to South-East Asia costs £370,000 and it was also revealed Prince Charles pays £1 million annually to support the Duke, Duchess and Prince Harry in their official duties. William, Kate and Harry employ 10.5 staff and have "no plans" to increase this number, suggesting Prince William will be remaining with the forces in some capacity. Next, we share a selection of fashion updates. The ever-popular Rhumba Boots by Aquatalia are back due to popular demand. The $698 weatherproof suede boots have been a staple of Kate's wardrobe for years. The Duchess has teamed them with everything from tartan coats and red suits to jeans and a casual top. The Italian made boots feature a half inside zipper and a slip resistant rubber sole. They're available in black suede and espresso suede at Aquatalia and Lord & Taylor (receive 20% off by using the promo code JULY). Fans of Emilia Wickstead will be interested to know a number of her designs are significantly reduced at Matches. Kate's Marella Coat is now available for €770 - a 50% discount. The Duchess wore the summery coat to the Queen's Garden Party in May; it was a lovely choice for the occasion. 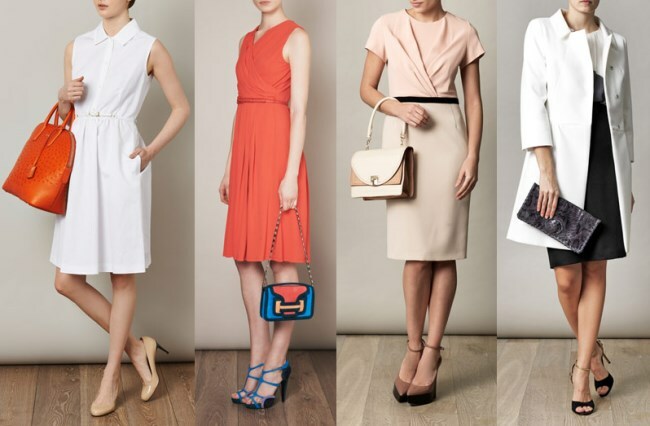 We also looked at four MaxMara Studio sale pieces; all very pretty items I could easily see the Duchess in. 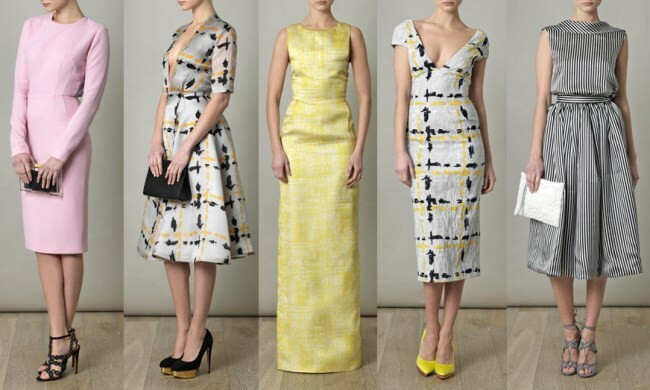 I anticipate we'll see Kate opting for MaxMara designs quite a bit when she returns to royal duties. And up to 50% off Alexander McQueen including the Cowl Neck Silk Crepe Dress (Pippa's bridesmaid dress, reduced from €2,394 to €1,196). I must say, I'm not always a fan of McQueen designs but they do tailoring impeccably well. Before we start enjoying all the fabulous designs on offer for Spring/Summer 2014 I wanted to share a cursory glance at Jenny Packham's AW13 Pre Collection. The garments could have been custom made for Kate and feature stunning embellishment and detailing on the waists. Jenny Packham's shimmering gowns look fabulous in paler colours but equally well in deeper jewel tones. I'm very much hoping we see the Duchess in a design from this collection at some point. We leave you with a video of Kate and Pippa which was taken in late 2007 after she and William got back together (with many thanks to British Royals). They were walking home to their Chelsea flat following a night out at Raffles nightclub and were hounded by paparazzi. I'd never seen it until today; it shows just how terribly difficult a life in the public eye is and what a challenging time Kate has had, I think she's handled it all incredibly well. It must have been very intimidating for her, particularly before the engagement. The video is bad quality but if you wish to watch it you can do so here! Hello, all! Yes, I must admit I have been checking the news several times a day in the last few days. So exciting! I watched the video of the paparazzi and the way they treated Kate. I am absolutely horrified by the behavior, did anyone else hear the man at the end of the video who called her a "Berkshire harlot?" I can't believe it, and it's a wonder she stuck it out as she did. Well, hopefully in the next few days we will all get some very joyful news, and I do think that the idea that many have had here in the States about hosting baby showers for charity to commemorate the occasion is very sweet. We all have our eyes firmly fixed on this blog, Charlotte! I didn't hear that, I am really shocked by that behaviour. It must have been so upsetting and intimidating. Thankfully the royal protection officers are there now. The video was appalling and quite disturbing to me. I wish I hadn't watched it. I am presently reading a "novel" detailing the lives of Charles and Anne Morrow Lindbergh. Another time, another place (although they did live in England for a while), I know, but I have thought of Kate and William so much as I read. The Lindberghs, too, were hounded by the media relentlessly from Day One. The resulting stress and unhappiness ruined their lives and damaged their marriage. They, in fact, blamed the press for the kidnapping and death of their little son, and at one point they considered moving to Nazi Germany because Hitler did such a masterful job of controlling the press, thereby giving them some peace! So, yes!! Thank goodness for the royal protection officers! However, it must still be miserable not to be able to stick your head out the door without facing the intrusive, ubiquitous cameras. And poor Pippa! Although the scrutiny on her is not so intense as it is on Kate, she has no room to breathe either. I love seeing pictures of all the royals (Pippa and the Middletons, too), but the Lindbergh book (The Aviator's Wife by Melanie Benjamin), coupled with the video clip of Kate and Pippa, makes me feel quite guilty, I'm afraid. I might try to restrict my future viewing to official pictures only. Try at 0:46. The video is very cruel. What scums! Her life is not so easy as it looks. We don't know most of the things happening behind the curtains. And I don't understand this ridiculous hysteria about the baby. The last thing I would do, is showing my new born baby to the people I don't know, especially to the ones who make money from it. She has to do many thing she doesn't like to and to look happy. She smiles at the cameras but when she's aside and thinks nobody watching her she looks sad. Her life isn't so brilliant as we see but she's caring it on very bravely. I agree 100% with Anonymous. While I'd love to have certain elements of her life (the closet, for one!) for the most part I do NOT envy her. The constant scrutiny would drive me insane. I agree 100% with Anonymous. While I'd love to have certain elements of her life (the closet, for one!) for the most part I do NOT envy her. Kate handled it beautifully. It looks quite frightening! Yes. The man calls her that awful name at 47 seconds, as the paparazzi are walking away. He says it at a normal voice volume, so hopefully Kate did not hear it. Kate is so classy. It is interesting to watch the paparazzi make fools of themselves--like toddlers throwing a tantrum. My impression was that he said: "thanks your highness." And I also thought I heard one of them say "see you later". Both rather taunting and mean-spirited remarks IMO. It's one thing (and I hope I don't sound as if I am defending them) to have a "job" to do and take pictures, but the remarks are almost worse than the photos IMO. As for the paparazzi, what a bunch of jerks. As for Kensington Palace so glad it's being renovated. Get rid of all that nasty asbestos. Fantastic weather here! Happy summer all of my Duchess Kate fans. Sarah, been thinking about you and praying your week was good despite the circumstances. So happy to see your cheery post! The white Alexander Mcqueen cowl dress is very similar to Pippa's bridemaids dress. Always amazes me how much younger and stylish Kate looks when she's NOT at official engagements nowadays. Hope the new hairstylist talks her into cutting a few inches off that hair and adding a few layers. It's too heavy and aging in my opinion. Interesting that the Palace is being a bit more forthcoming with information about the remodel and who exactly is footing the bill for it. As I comment rarely, Charlotte let me say how I enjoy your blog. I love historical hints and explications on what Kate is visiting/seeing on her appereances. Thanks! Oh and Kate from Texas, your pictures were a treats! Re the video; "This is my private life. I am not going to remove my hand [from in front of face]." Go Kate! That video is disgraceful---no one should be subjected to that. Really the police should not have allowed a gang of men to treat a woman like that. Strange isn't it that people who keep insisting that the Duke and Duchess become full-time royals are some of the first to complain if there is a cost.At present Prince Charles bears the cost from his private fortune, but if Catherine were to take on engagements every day, she would certainly have to have a full time nanny at the very least. Interesting to see Catherine has a different hairdresser--I wonder if he is responsible for the pretty "half-up" styles she has had recently. Most of the world---well except DM bloggers, are awaiting the baby's arrival. I think much of the interest is because, for the first time we know this child will be the heir--before this it has always been hoping for a boy!. I remember the birth of Prince Charles and Prince William---but not the fuss there is now, but of course, they were both before the internet. Just pray for a safe delivery and a healthy child--really what one hopes for any newborn. I don't see any inconsistency between complaining about the costs incurred by the taxpayers for W&K's personal expenses and wanting them to do more. The only way to justify taking money from British taxpayers and giving it to an unaccountable, unelected family is if that family does a bang-up job representing the UK abroad, taking charity work seriously, and providing a symbol of national unity. This is especially important when the government is cutting spending in other areas in response to the financial situation. Maybe one day the Duke and Duchess will provide a good value to the nation, like the Queen has for so many decades, but for now, I'm afraid that I have to shake my head at the thought of even a nominal amount of my tax dollars going to a couple who can't bother to take on royal duties full-time, but is more than happy to enjoy the perks and privileges afforded to full-time royals. Just my opinion! Still love Kate's outfits and look forward to the day when she eventually takes on a full slate of royal duties. Hopefully no one comes around insisting that I need to give the Duchess a break . . . If you would do a little mor research the queen gave w&k a couple years to enjoy married life. You are always so critical toward w&k and I should expect your critical comments. How saracastic of you to even say that at the end as I know who you r referring too. And yes you do need to give the duchess a break. I know I'm not the only one who thinks you are constantly against w&k. Please consider replying to daily mail comments where your comments would be in a majority. Anyone who doesn't understand William and Kate's life at the moment, and the reasons behind it, missed out on the last few chapters of royal history. The reasons for what is happening (or not!) at this time go back decades. @ Anonymous 21:22 (from original Anonymous): hmmm perhaps you have me confused with someone else, or think that all of the "Anonymous" posters with slightly critical posts regarding the Duke and Duchess are the same person? Just wondering, because I haven't made very many comments on the blog (mostly I show up to look at Kate's clothes) and your response seems a little over-the-top hostile. Either way, I certainly respect your devotion to the Duchess, and I only ask that you and other posters display a modicum of respect to dissenting opinions as well. My opinion is that both Kate and William should do more royal engagements, and be more conscious regarding how some of their activities (KP renovation at partly the taxpayers expense, trips to Mustique when the official story was that Kate was too ill to work) would play in public opinion. I do, however, think that both of them have plenty of time to figure things out and live up to the current Queen's marvelous example. With that said, I have to commend Charlotte for taking an exceedingly classy and diplomatic view to the discussions here in the comments. I only wish all of the commenters shared her welcoming attitude and politeness. Well said Jean, in every comment. Hope you are having a lovely summer. Just seen an item on TV about the extremely high temperatures in you part of the world. Hope you are managing to keep cool. I enjoy the insight you provide in your posts, too. I, too, hope Sarah is staying cool. I live in the Sacramento area. We are fortunate in California to have dry heat instead of the humid, heavy heat of the South and the East. It is bearable. At night, Sacramento and the foothills get the Delta Breeze off the Sacramento Delta which brings welcome relief and cools down the entire house when the Whole House Fan is run. In a few days, we will reach 108*F, but we will plunge to a nice, cool 73*F at night. Some nights remain hot and still; those are the most trying. Looks like the temps in sunny CA are as bad as Texas. The Texas heat is unbearable right now. Today's temps reached 104 with the heat index at 110. At 8:00 tonight my car read 101 degrees. So very hot. :( I hate that my kids get to play outside first thing in the morning and then late in the evening. We desperately need rain too. Alas, wishing I was back in the UK wearing my long sleeves and scarves!!! Thank you Jean and Melanie for your kind thoughts. Yesterday we laid my Father in law to rest R.I.P. fortunately we had a light breeze from off the ocean (grave site burial) I had thought we would all melt in the sun. Then there were about 75 people at my home for a wake. Unfortunately I live 10 miles away from the ocean so we had no breeze (only 2 fans) in the house and we were melting. The relatives from Sacramento thought the temperature was great, I couldn't complain knowing that family in other parts of the state were much hotter. Kate I was thinking about you too. Knowing that it was much hotter where you are at. I also wanted to thank you for your encouragement through these last few weeks via email. We had a very special gathering with all of the siblings together.That probably won't happen again for a long time. Does it get in the 100° anywhere in England? Prayers coming your way my friend. Thank you so much Charlotte. What an amazing and supportive group of people we have on this Blog :) so refreshing. That video shows appalling behaviour and must have been very scary for them both (Kate & Pippa) especially being dark and the flashing, just awful. A very dangerous situation. Its surprising that knowing what Diana went through etc. that officially 'royal' or not protection wasn't provided. I, too, admit to checking this, my go-to site, several times a day as the royal birth approaches. :o) Thanks again, Charlotte, for your timely and informative posts!! As others have commented, that video is disgusting. The abhorrent behavior displayed by those paparazzi reminds me of a bunch of hyenas stalking prey - especially that vile laugh at the end of the video. No wonder William was adamant that Kate have protection as soon as their engagement was announced! And it must be a huge relief to both of them to know they'll have absolute privacy in their private garden at Kensington Palace and at Anmer Hall. It's hard to believe how rude they were, I do feel for Pippa in that sense and Harry's new girlfriend Cressida. The paparazzi are scumb bags that video makes me sick and reminds me of what HRH princess Diana of Wales went through daily until she died. Oh Charlotte, so many updates in this awesome post! 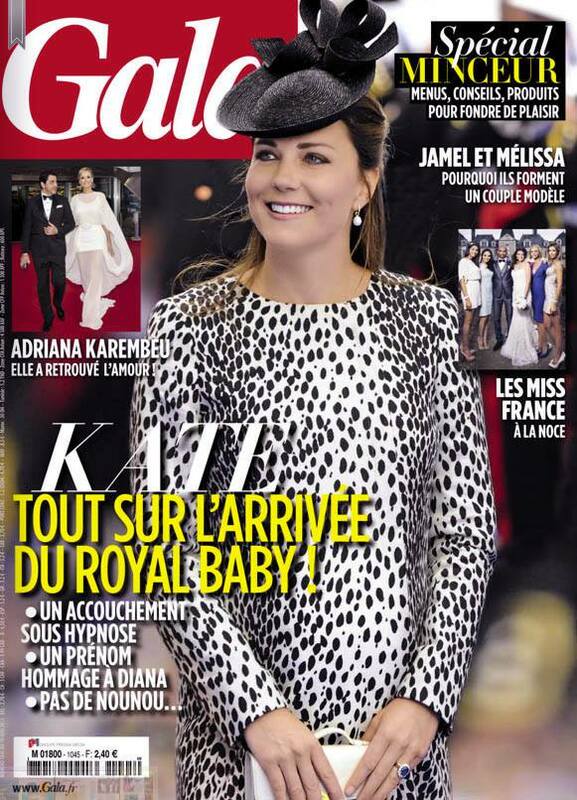 !The magazine cover, featuring Kate was one that I din't like at all. The white dress is too tight and the sweater does not match at all. I'm surprised the normally well dressed Kate chose to wear that.As far as the refurbishing cost of KP goes,that is a lot of taxpaying money to spend on an apartment! I guess the flip side of this expense is that Kate has provided the financial boost to the economy by her fashion choices(in terms of sales) and her charities. The video is horrible,,they are like vultures after their prey,, they seriously don't care who they hurt in the process, as long as they get some pictures. It's a 4 story 21 room house, really, with massive renovations that will serve the next tenants too. Siddhi that money for KP is for repairing the roof and removing asbestos for their 21 room apt not 57. The work need to be done anyway. Please be careful of what the media is reporting without getting all the facts right. My word, Theresa that sounds just terrifying. The paps are ruthless and willing to do almost anything to get a photo. Charlotte, thank you for your amazing blog. The Duchess has entrigued so many people with her grace and style, but it is so unfortunate that her popularity has brought out the worst in the press. So many of us envy her closet, and her abundant bank account, but I would bet that the Duchess would envy us our privacy. I look forward to the news of the new arrival. It always feels like you are a ticking time bomb for the last couple of weeks. Not knowing when or what will happen is nerve wracking. I can't even imagine what it would feel like to have the whole world watching. Maybe we should all envy her less, and admire her strength more. I thought at 0:46 he was saying, mockingly, "thanks, your highness", not "berkshire harlot". Slightly less obscene, but still condescending, disparaging and pejorative. thats what I understod as well! That's what I thought he said--sarcastic and extremely ill-mannered, but I think not actionable in law as the other would be. Of course as soon as the engagement was announced, she got protection, so now they turn the cameras on her siblings. Just think what Princess Diana went through especially during her last moments here on earth. The paparazzi were scum then and still are now anything for a photo. Really makes me sick. Kate and Pippa have so much class. And good for Kate not taking her arm down proud of her. Dear Charlotte have you seen these photos yet? also do you have any better photos from the who magazine you posted the cover of? Thank you in advance and have a lovely weekend. I did a post on the trench coat photos earlier this week but couldn't post one because they are owned by IKON pictures who pursue copyright issues vigorously. Thank you dear Charlotte for all you do! I can't figure out how to vote on your baby gender pole?! I will keep trying though! have a lovely week. The poll closed a few days ago but I would love to hear your thoughts! I'm very excited about Baby Cambridge's arrival... It feels like any time may be the time for an announcement! I'm having the worst weekend ever... My father had a heart-attack and almost died. Now he is in the hospital, at the intensive care unit. I'm really worried. Can't wait for this nightmare to be over. So sorry to hear about your father. Hope he feels better very soon-I'll be hoping and praying for him and you, Ana. Try to be strong Ana. Ana B. I am so sorry to hear about your father. Sending you my prayers and hugs. Just take it one day at a time. Hope that all goes well with your dad, Ana B. Sending prayers for your entire family. Ana B- I am praying for your family & your dad. Hope he will be ok. Hang in ther my friend. Ana B., I wish your father a fast recovery. Muita força! I am sickened and appalled at the paparazzi in the video. I have only read a couple comments, but I would assume everyone else feels the same. It's really absolutely disgusting. They are filth. I just cannot even imagine. 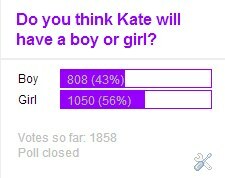 :-( Kate and Pippa handled it very well. It's got to be so upsetting and stressful to deal with that all the time. Good for Kate for being firm with them. I know Kate's only been William's wife for a brief two years, but I think she has done a flawless job. They do live with glitz, glamour, wealth, and privilege, but there's the "ugly" side as this video shows. It's sad that people act as these men did and find humor in it. On a happier note, I am so very excited about Baby C coming into the world! I loved Victoria Arbiter's comment! There truly is excitement and Royal baby fever everywhere!!! It's got to be daunting knowing the entire world is waiting for you to go into labor, but Kate has handled it with grace, poise, and class. I am sure she will do the same as she introduces Baby C to the world. After that, I hope that they can have the privacy they deserve. Charlotte, I know you will have the latest news and updates! I wish you knew exactly how many people follow your blog for the latest and greatest information. I think the numbers would be huge!!! 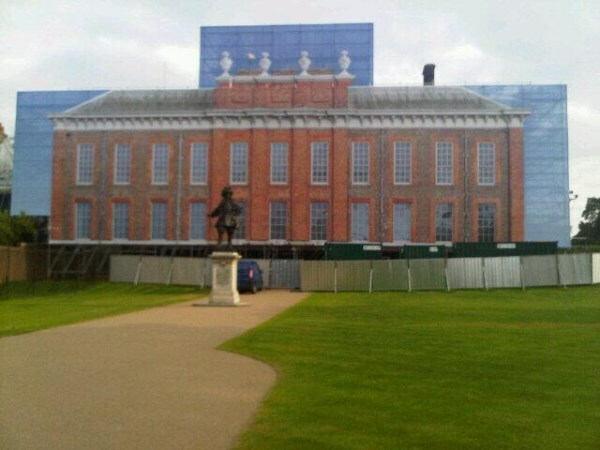 As far as all these renovations to Kensington Palace.... It's more than just 1A being worked on. Having been there and also walking by several times while I was in London, the scaffolding goes past where 1A is. You cannot go to what used to be the front before last years work where William III statue stands. That is all blocked off, but that is not part of 1A. I am not a British taxpayer and don't "pay" for the monarchy, but for those who are not happy about paying for the Royal family, their residences, etc., I would say this...think of all the money and attention the Royal family generates for Britain. I have been there several times for the beauty, history, and my love of the Royal family. I will continue to travel there on holiday for many reasons, one of them being interested in all things Royal. I have been to KP several times and will continue to go. Every time I am there, there's always a long line to enter. People will pay to visit. Renovations and upkeep must be done. As stated above, the Royal baby will generate 260 million pounds worldwide. I suppose a good part will be in Britain. Just seems to me paying a bit for the Royal family seems like a good thing IMO. Maybe a baby on July 1??? That would be a lovely honor to Diana. We shall see.... In the meantime, I'll enjoy looking at the beautiful dresses posted above (LOVE Jenny Packham) and wonder when the glorious announcement of Baby Cambridge's arrival will be! Happy weekend everyone! Nobody's disagreeing that the royal family is good for tourism. However, the UK unemployment rate is 7.8 percent with about 2.5 million people out of work. When you take an honest look at the personal wealth of the queen and Prince Charles, not to mention William and Harry, I don't think it's unfair for the government to ask the royal family to foot a bit more of the bill. Times are tough and families are struggling in the UK. Those who queue to see KP or to see Kate at an engagement aren't representing the entire nation. There are plenty who question the relevance and need for the state to maintain the royals when they are so independently wealthy. That's not criticism, that's just reality. I fear as Charles, Camilla, William, Kate and Harry take over, with their obvious dislike of appearing at public engagements and disdain for the public and the media, the questions about the need for a state-maintained figurehead monarchy will only get louder. Very well put Elizabeth and I agree with you heartily. I am a firm royalist and generally think the RF give good value for money. However, I do think that in these troubled economic times, it is difficult for many people to see additional monies been give to the RF when schools, hospitals and essential services are being squeezed tighter and tighter. With all due respect to HM, I think the Queen could have funded the 5% increase from her immense personal wealth without any hardship and such a gesture would have been fantastically received by the public. I think a substantial part of the public's affection for the RF revolves around the Queen and the years of dignified selfless service she has given the UK. Whether this level of good will remains when Charles comes to the throne remains to be seen but I do think that the RF needs to be seen to be in tune with what is happening in their country. It's absolutely horrifying! After Princess Diana, the paparazzi still haven't changed! It's a shame! I heard Kate saying, "It's my private life". Didn't even see her in the video! 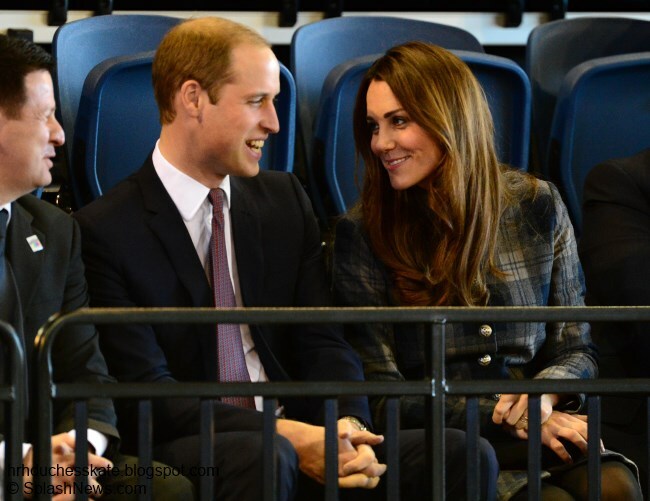 William must be terribly proud of Kate and her having adjusted so well to living in the spotlight! Seeing that video makes me feel quite sad :( What a horrible position to be in, to be hounded & forced to stop and hide ones face in the street like that, shame on those photographers. is the hair salon picture from june itself?her baby bump looks so small on here compared to her last engagement. almost as small as the helicopter pics with william as compared to official engagements where her baby bumps looked much bigger. I read that too. My thoughts were that it has more to do with PR. Without even trying to, Kate's presence in the royal family has had an eclipse-like effect similar to when Diana joined the family. Bluefire, I find your comments so cryptic and abbreviated that I'm having trouble interpreting them. Your comments about the duke and duchess ostensibly telling Pippa to stay away from the limelight (?) and something about Prince Harry's girlfriend and a graduation dance show intrigue me--I think. Can you be more expansive for an old lady who doesn't know all the abbreviations, etc. Checking in to see if there's any action across the pond!!! Today is my daughter's 7th birthday and she really wanted a baby prince or princess born on her day. :) We've been celebrating her all weekend! Looking forward to celebrating a Royal heir very soon! My kiddos have planned a party to celebrate!!!! I know how you feel Kate, I keep thinking today is the day. It would be quite something is the baby was born tomorrow, Diana's birthday.. I can only say the paparazzi are scum bags. Kate and Pippa showed real class. As far as KP the renos had to be done it's a national landmark just like the White House these are very old buildings and must be maintained and yes us taxpayers do foot the bill one way or another. I want to say Happy Birthday to Princess Diana I due hope baby C would arrive July 1 that would be so awsome. If not checking your site many time daily Charlotte it's getting exciting!!! Kate and Sarah hope you are keeping cool we had 6" of rain yesterday and flooded our basement and streets turned into rivers. More rain in the forecast. Kate hope your daughter had a very merry birthday. My daughter had a wonderful birthday weekend. She had her big party yesterday with 25 friends and today we had a big lunch and swimming celebration with close family friends. It has been a great weekend! Charlotte, she refers to you as Kate's friend which I think is very cute. :-) Your "Kate's friend" because you know all about her and tell everyone about her. I'll tell her you said Happy Birthday. She will be delighted! I'm so excited. What a special time for William and Kate (and their families) personally, and for history. As a British person I can say the amounts that are spent Is hard to justify when our country is in such dire straits. However I would imagine most people don't comment as always shot down and it won't make any difference we will always have a royal family. So many residential homes they have, it would be interesting to know the cost they raise through the charity work as opposed not to offering help. I get fed up with will n kate choosing part royal life part military. U either in or out. Polly. Bath. I thought the video of Kate and Pippa was shocking and I wish I had not watched it either--because my watching it provides a sort of rationale for its existence and I'd rather not give that kind of paparazzi any support whatsoever. I shall be much more careful of the links I click from now on. In regard to the cost of renovations to the Kensington Palace apartments, I think that they were long overdue and needed to be done regardless of who will be inhabiting it. With the asbestos, it would be a health hazard to anybody using the place, whether for an office or for living in, wouldn't it? I agree the timing is bad, given the economic woes of the country, but then what other choices were there? Raze the palace? Leave it alone and never use it again? Find another home for the Royal Heirs? I read somewhere that the Queen is ultimately and indirectly paying most of the costs after all, through her own taxes. What would be a reputable source for such a statement? It's hard to know what to believe. I think Kate is carrying the baby in a way that makes her not look as big as other women. I had a friend whose figure was a lot like Kate's, and she barely looked pregnant at 9 months for her first pregnancy and delivered a normal-sized and healthy baby with little trouble. May Kate do the same! I would like to see what Kate's hair looks like now. But I shall wait! I would have liked the baby to be born July 1st for sentimental reasons, but then I had a premature baby and do not wish ANY baby to be born prematurely, not even a day, for any sentimental reasons--the full term as determined by the baby's and mother's bodies working together is worth waiting for. My sympathies and prayers go out to you, Sarah from California, and to you, Ana from Brazil. May your situations ease and peace come to you. Don't the KP renovations provide jobs that might otherwise not exist? Before a so-called journalist writes an angry article about the renovations of W&K's apartment, she should get her facts straight. Their apartment has 21 rooms and not 57. And it wouldn't hurt to include the fact that the apartment hadn't been renovated since the early 1960's, or that the work would have been required regardless of the names of the residents. But then it wouldn't have the outrage-factor, would it? I absolutely love that It looks so beautiful on you This is a great post ! it was very informative. I look forward in reading more of your work.